Apple and Samsung would have you believe quality smartphones should cost the many hundreds of pounds you must sacrifice to obtain their rarefied devices. But in recent years, the march of time has made that notion obsolete. In 2012, a £200 device was nearly unusable. But now? Sharp screens are cheap, and fast processors are even cheaper. Inexpensive smartphones have been pretty good for years! And so, the £239 Motorola G6 is the latest in the company’s line of devices serving as a harbinger of the inevitable: Pretty good might be good enough for everyone. Sure, it’s missing a few niceties, and looks like a generic slab of plastic, but those faults are easy to ignore for under £300. Did I mention it has a headphone jack? The Lenovo-owned Motorola has been working to make more affordable Android smartphones a compelling option, and has done pretty well so far. There are definitely cheaper phones on the market, even from Motorola itself. The company makes the budget E4 and E4 Plus, priced well below the G6’s £239 price tag. 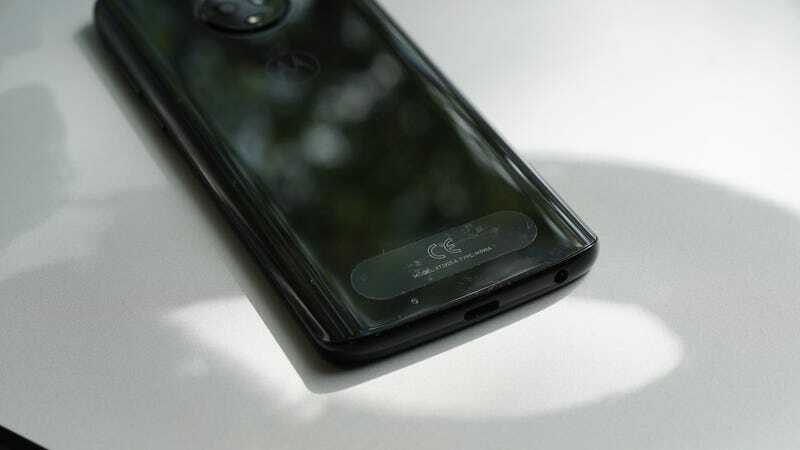 The Moto G line of smartphones represents the company’s mid-range tier, which means you can expect a slightly bigger and better device, but nothing like the company’s flagship Moto Z line, which features a much faster processor and supports the company’s Moto Mod phone add-ons. Still, £239 is £239, and you get what you pay for. So let’s run through the trade offs you’ll be faced with if you decide to go cheap. The G6, running a near-stock Android 8.0, has an all-glass body made of Corning’s Gorilla Glass 3. Unfortunately it feels more like plastic with a few coats of gloss on top. It’s slippery, and prone to collecting an unsightly amount of fingerprints. Its thin power button and volume rocker aren’t as tactile as they need to be, and make it difficult to tell when you’ve actually pressed them. 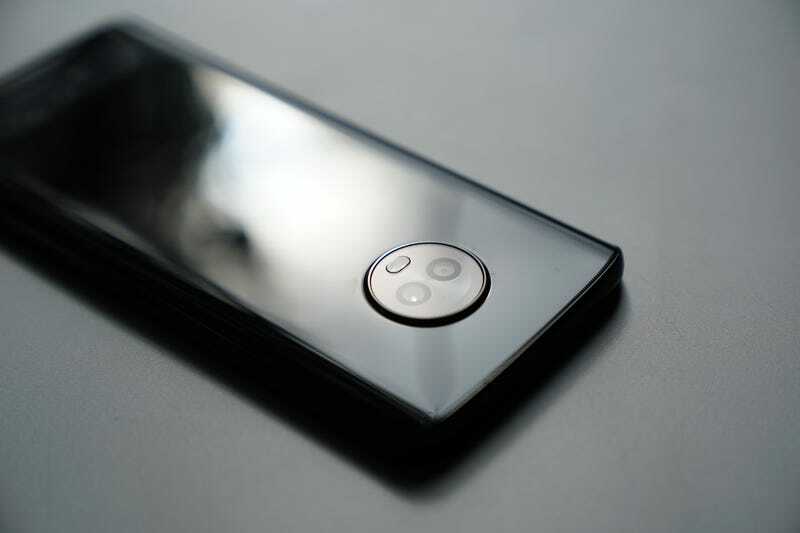 Its home button is an oblong capacitive fingerprint sensor that supports left and right swiping to go back and access recent apps, respectively. It’s got a pair of rear cameras, one 12-megapixel and one 5-megapixel, though the latter is used in service of photo effects like a hit-or-miss portrait mode (that can’t properly blur around my bald head for some reason) and selective colour effects. It’s an expensive gimmick to have, one I’d rather replace with a lens capable of optical zoom. But hey, everyone loves portrait mode, I guess. There’s also an 8-megapixel front-facing camera for your standard-fare selfie. The camera app supports an assortment of features like filters and Google Lens. But your photos won’t make any great impressions, and so-so low-light performance means your images will be grainier than you’d like. It’s also pretty sluggish to start, and the slight delay from tapping the shutter button is too long for my liking. There’s no wireless charging support, nor is there NFC. Wireless charging might be a luxury, but removing connectivity options like NFC, used to pair with accessories, share data with people, and pay for things using your smartphone seems like a mistake. Also don’t expect any serious waterproofing. The G6 opts for a “water repellent nano-coating” to protect it from random splash damage. But it won’t help after a few minutes submerged. Yes, you can play PUBG (on the lowest graphical setting) and whatever other game captures your fancy, but don’t expect any stunning visuals. Also, expect a scorching hot phone after a few minutes of stalking opponents through the woods. Games designed to run at the more common 16:9 aspect ratio suffer from justification to the left of the display, leaving a small black bar where the extra real estate is. It sounds like I’m ripping on it, but those gripes are compared to much pricier phones! The G6 is actually pretty good at being a decent smartphone, especially for the price. A good screen, enough room for apps and photos, and USB-C support add up to a smartphone that seeks to excel at what people care about most, and focuses on the fundamentals before adding (or not adding) on extras. There’s 32GB of built-in storage to work with and some breathing room thanks to a microSD card slot. There’s a USB-C port, along with a headphone jack, two popular interfaces your thousand-pound iOS device doesn’t have (and desperately needs). It’s got a 5.7-inch 2220 x 1080 display (that gives it an 18:9 aspect ratio), and Snapdragon 450 processor. Instead of adding a garish skin or suite of custom icons, the G6's customisation comes in the form of its Moto Actions app. The gesturing feature lets you activate often used features—like turning on the flashlight, opening the camera app, or silencing your phone—by flicking your wrist or flipping your phone upside down. Since the company introduced the feature in its beloved Moto X, it’s been my favourite thing about the company’s devices. The Motorola G6 looks like every other no-name Android smartphone. It’s a real shame. I’m not saying the G6 should be your next smartphone. If you’ve got the cash, get yourself something with more oomph in the processing department. But the Motorola G6 is the perfect smartphone for those existing in a liminal space, who would rather avoid using a cripplingly slow device until their ship comes in. Break your iPhone? Don’t pay for another one when a new device is around the corner. Get a G6. Did your mum drop her flip phone in the ocean on holiday? Send her a G6 instead of flowers. Your butterfingers teenager need a smartphone? Until they’re done sweating from all that puberty, give them a G6. It’s good enough that they won’t sweat the stuff cut to make it cheap. £239 for a decent smartphone with a 1080p screen is a great deal. Camera is fine. Just fine. Slippery back and ugly design make it the perfect candidate for a case. Play whatever games you want, just be prepared for them to look bad. Perfect impulse buy after totalling your flagship Android phone you got on a 24-month contract.